Salsa verde, green sauce. Mexican version made with tomatillos. Tomatillos are small fruits (used as a vegetable) enclosed in a husk. The fruit resembles a small unripe tomato and is usually green or yellow. The yellow color indicates ripeness, but tomatillos are most often used when they are still green. Green tomatillos are firmer and easier to slice. The husk that holds the fruit is paper like and is light brown. The flesh is slightly acidic with a hint of lemon. Tomatillos belong to the same family as tomatoes. The husks must be removed before preparing, but tomatillos in the husk are often used as decoration. Wash the fruit with water to remove the film left by the husk. Tomatillos may be used raw in salsas or salads or cooked for sauces. Cooking enhances the flavor and softens its skin, but the result is a soupy consistency since the fruit collapses after a few minutes. In large pot, heat oil over medium heat. Add onions, salt and pepper, stir. Cook onions until tender. Add remaining ingredients. Stir well. Turn heat to high and bring to boil. Reduce heat, cover and simmer about 60 minutes. Cook until potatoes tender. Enjoy! I wish I could always have this on hand in case of a cold. Looks so warm and comforting! Sounds very full of wonderful comforting flavors! I had a big pot of soup going today too. Wish I saw this post before I hit Wegman's today, they had beautiful tomatillos but I didn't know how to prepare them, this would have been perfect! Thanks for sharing. Chicken soup is about the most comforting meal on the planet! Cold and rainy here tonight, so soup sounds perfect! Plus, I love green salsa!!! This looks delicious! Perfect soup weather. 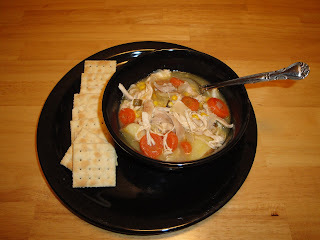 Chicken and vegetable soup is such a comforting meal on a cold fall or winter day! My kids have been sick for days now - I would love a nice pot of homemade chicken soup. Sounds all warm and toasty! Wow, this looks easy to throw together and sounds delicious! I'm a fan of tomatillos although I've never worked with them. I always thought they weren't related to tomatoes...thanks for the info! Looks so appealing!I love the presentation..too it is so elegant and yummy.. I hope your children feel better soon. Thank you for all your warm comments. I appreciate you and your comments. I adore salsa verde--it really dresses up a simple dish, doesn't it? Yes, salsa verde adds a lot of flavor to dishes. Love it. I don't know what happened to my comment. Christine, your chicken soup looks very comforting. Ohh, I love the Mexican twist on this soup! Love salsa verde! I love this soup, especially with sala verde, and all of the vegetables. soup is perfect for rainy Fall days, we have been having. Thanks for sharing. Absolutely loved these. In India, we cook tomatillos in a different way. I loved your style too! Looks like I need to make this very soon! !